Posted on September 16, 2011, in cemetery, haiku, Haiku My Heart, Hawaii, Monday Poetry Train Revisited, my digital photos, my haiku, Nanakuli, Oahu, Sensational Haiku Wednesday, The Height of Haiku Challenge. Bookmark the permalink. 15 Comments. The sparrows are good – they give a very Eastern feel too I think. The sound of chimes heals? 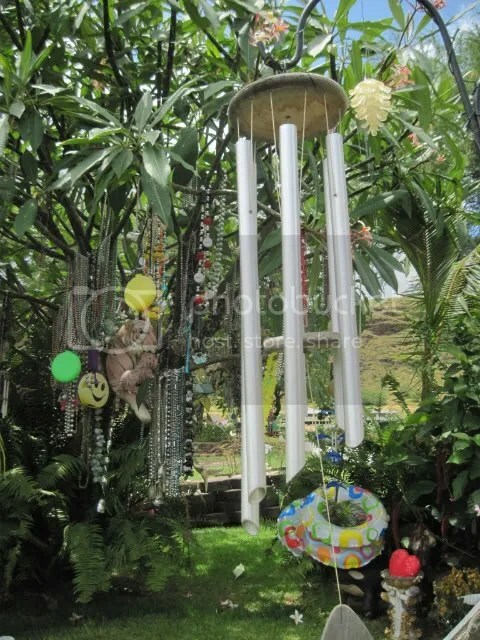 Chimes and sparrows’ sound…I could hear it MMT! The photo is very nice too! Recently I had done a post on sparrows and goodness it is so apt, their chirps and the tinkling bells!! You have connected it so well! The sparrow line is cool. I love the sound of chimes and yes! can image thousands of sparrows singing. Another image that makes me feel happy — that fleeting happy I know is real, simply because it flies by so fast. No cynicism at all! That’s the nature of happiness, I think. Ephemeral. We lament the loss of the hedge sparrow to our fields nearby, but we do have the tinkling of wind chimes! Lovely pic. Wow, not sure I could handle that many birds, but depending on the chime, it definitely can soothe the soul.